We do not collect data or place any cookies simply from visiting our website. If you make a £5 donation by texting PATH00 £5 to 70070, we do not find out who sent the donation and simply receive the donation from Just Text Giving. If you become a registered supporter, we will keep your name, address and telephone number, email address, and whether you have made a gift aid declaration or not. We use the information to send the Annual Report by post and to invite you to join our email newsletter list (see below). We also note whether subscriptions are one off or by standing order, so that we can encourage greater use of standing orders. You can ask us not to keep information, but then we will no longer be able to send you the Annual Report or count you as a registered supporter. We do not pass registered supporters' information to any third parties, save as demanded by law. For example, if HMRC asked us to prove that we held a particular gift aid declaration, we would have to provide this to them. The details of a registered supporter are deleted when the registered supporter writes to the Trust to cancel his support or to ask us to delete the details. If this happens we are no longer able to send an Annual Report. We will still retain gift aid declarations for 6 years, to comply with HMRC requirements. Email addresses are collected by Yahoo Groups from people who register to receive email news from the Trust. They are only used to provide the email address owner with news from the Trust. The automated Yahoo Groups service allows any recipient to withdraw from receiving the Trust's news emails at any time. 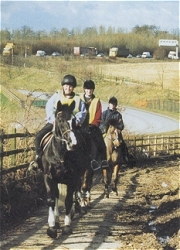 Twitter names are collected by Twitter from people who follow pgbridleways. Twitter allows followers to unsubscribe at any time. Anyone (not just registered suppoerters) can follow us on Twitter. We have no control over how Twitter handles your data. Information given on an evidence form (or equivalent) will be given to the relevant council as part of the legal process of recording a path. Such information then falls under the council's data protection regime, and will become public once the Council starts to process the application. The name and contact details given on an evidence form cannot be withdrawn once passed to the council. We may share information on an evidence form with other user groups (like the British Horse Society) but only for the purposes of recording the path in question or ones nearby, and not for other purposes like marketing.